Stephen Hayes, American Beauty, 2012, oil on canvas, 60 x 90″. 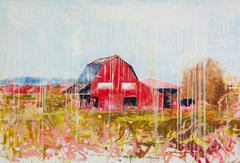 The pastoral scenes found in Hayes’s current exhibition, “In Valley,” are peppered with electric juxtapositions of color, meandering brushstrokes, and streaming lines of glaze that speak to Pierre Bonnard’s maxim “A painting that is well composed is half finished.” Nowhere is this truer than in the work To Think of Time, 2012. Here, a lone building sits in a field represented by a thick snaking of green brushstrokes that appear to float atop a vortex of bright cadmium underpainting that threatens to swallow it like quicksand. Throughout all of the paintings, nature is represented in a constant state of flux, while the buildings and roads that inhabit each environment possess a serene clarity and refinement. It’s challenging to discern the implications of this contrast. Do Hayes’s vivid reimaginings of the rural contain an important message for our time? Or are they, at the end of the day, an exercise in the formal pleasures of painting, swelling with visionary insight still in search of its message? In the hands of such a skilled painter, the ambiguity stings.